When a friend of mine found out I was discerning a call to the priesthood, she gave me a book I had never heard of. 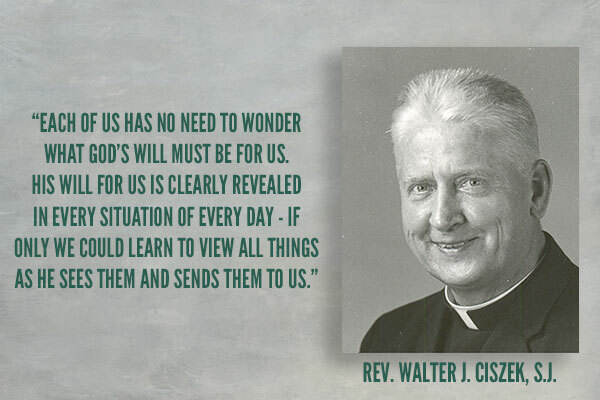 The title was, He Leadeth Me, by a Jesuit priest named Walter Ciszek. 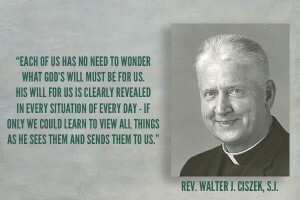 Little did I know the influence this man would have on me and my vocation to the priesthood. Now, I have to mention this is Fr. Ciszek’s second book. His first book, With God in Russia, is more of an autobiography of his amazing life story as a prisoner in a Soviet Gulag for twenty-three years, while this book focuses on his spirituality and the lessons he learned about prayer, God, and himself while doing his time in Siberia. What struck me the most from Fr. Ciszek’s story is the amount of faith he had while enduring numerous trials. He never has anything negative or hurtful to say about God or the sad circumstances he found himself in. He always trusted that God had a plan for him and that God would take of him. And God did! God sees Fr. Ciszek through some desperate and life threatening situations. As I read his story, I couldn’t help but be inspired by him. I wanted to live a life fully devoted to God, in both the good times and bad times. I try to imitate this faith during my time in the seminary. However, I soon found out that I was nowhere near as strong or faithful as Fr. Ciszek was. Minor problems would and sometimes still cause me problems. However, I know that God is leading me just like He had lead Fr. Ciszek. I have to remember that there is only one Fr. Ciszek, and I am not him. As hard as I try, I will never be him. I have to be to be me, because that is who God is calling me to be. God calls many different men to the priesthood because we all offer different gifts to His Church. Nobody is the same as the next guy, and we all have to try our best to follow that path that God wants us to be on. God is leading all of us, and through the inspiration of a holy man like Fr. Ciszek, let us pray that we too might have the courage to stand up for our faith and live for God, who gives us all we need. Lord, Jesus Christ, I ask the grace to accept the sadness in my heart, as your will for me, in this moment. I offer it up, in union with your sufferings, for those who are in deepest need of your redeeming grace. I surrender myself to your Father’s will and I ask you to help me to move on to the next task that you have set for me. to thoughts of giving to those who need my help. As I give myself to you, help me to provide for the salvation of those who come to me in need. May I find my healing in this giving. May I always accept God’s will. May I find my true self by living for others in a spirit of sacrifice and suffering. May I die more fully to myself, and live more fully in you. As I seek to surrender to the Father’s will, may I come to trust that he will do everything for me.